The Willows is situated in Shillingstone near Blandford Forum in Dorset and we can be contacted by any of the below. We have also provided a map to assist with finding us. From Blandford Forum take the A350 towards Shaftesbury. At the bridge with the traffic lights turn left onto the A357 towards Sturminster Newton. Travel along this road through the village of Durweston and after approximately 2 miles you will enter the village of Shillingstone. The Willows is approximately 0.2 miles into the village on the main road and will be on the right. From Shaftesbury take the A350 to Blandford Forum and follow this road for approximately 10 - 11 miles passing through several villages and then Stourpaine. At the traffic lights on the junction with the A357 turn right towards Sturminster Newton. Travel along this road through the village of Durweston and after approximately 2 miles you will enter the village of Shillingstone. The Willows is approximately 0.2 miles into the village on the main road and will be on the right. From Sherborne take the A352 heading for Dorchester. Turn left onto the A3030 towards Sturminster Newton. Turn right onto the A357 at Lydlinch Common signposted for Sturminster Newton and Blandford Forum. At Sturminster Newton bridge traffic lights go staight ahead towards Blandford Forum. 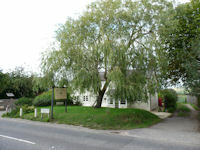 After approximately 3.8 miles having entered the village of Shillingstone The Willows will be on the left.